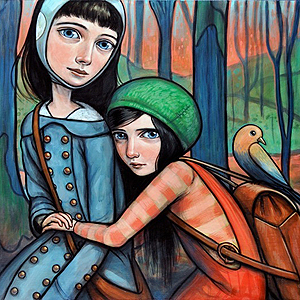 Kelly Vivanco’s paintings are shaped by her intuitive associations and her openness to play. By gleaning inspiration from memory, dream, imagination, children’s books, and vintage photography, the artist’s imagery revels in a composite world of fantasy and magic. Vivanco embraces the whimsical, and gently subverts our expectations of habitual narratives, objects, and characters, through a dreamy and playful web of associative free encounters. In this world the familiar is transformed into the extraordinary and the beautifully odd. Drawing from the tradition of portraiture, and yet transforming its conventions in the service of the unusual, the artist’s imagined portraits, whether they be of people or animals, deftly combine affect and play. Vivanco’s dynamic combinations of ambiguously ageless characters, often betraying precocious moods, and Kenneth Grahame like animal creatures, lead us into a world beyond the confines of adult disenchantment. 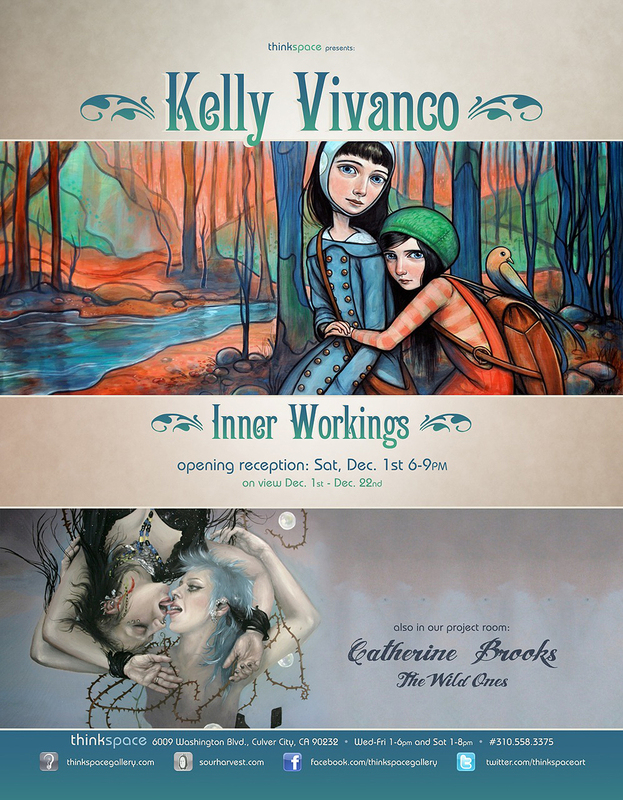 Vivanco’s world is lovely and strange, offering a host of alluring characters, creatures, and animal friends. Often working in smaller formats, or incorporating sculptural environments to frame and house her imagery, Vivanco’s work is executed with the intimacy and personal detail of the dream. These “dreams” are disclosed through conventions akin to those of the fairytale. While Vivanco’s approach to the construction of her imagery is self-described as organic and without symbolic premeditation, the images resonate with personal feeling and intensity, and the strangeness of the subconscious. Fairy tale is the stuff of dream, affect, magic, and nostalgia, and Vivanco’s paintings can be likened to this tradition of delight in playful narrative and free association. Therein lies their endless charm. Vivanco’s paintings are playful glimpses into an otherworldly suspension of time and space; a realm of magic, ambiguity, and labyrinthine wonder.